Zep 3:14-18a Shout for joy! The Lord is in your midst and has removed the judgment against you. Fear not! The Lord will rejoice over you and renew you in his love. Rom 12:9-16 Let love be sincere: honor, be fervent, serve God, rejoice, endure suffering, keep praying, help the needy, be hospitable, bless your persecutors, weep with those who weep, and associate with the lowly. Is 12:2-3, 4bcd-6 "Among you is the great and Holy One of Israel." God is my savior, strength, and courage. With joy you'll draw water at the fount of salvation. Give the Lord thanks and praise; make known his name and deeds. Shout with exultation! 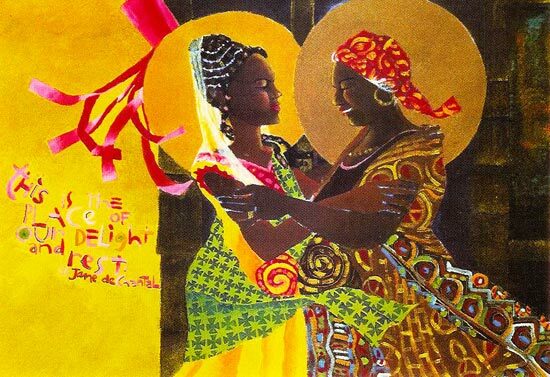 Lk 1:39-56 Mary traveled to Zechariah's house and greeted Elizabeth, who cried, “Blessed are you and the fruit of your womb. And how does my Lord's mother come to me? When I heard you, the infant in my womb leaped for joy. Blessed are you who believed God's word to you would be fulfilled.” Mary: “My soul proclaims the Lord's greatness; my spirit rejoices in God who looked on his servant. All will call me blessed: the Almighty is holy and has done great things for me. He has mercy, showed strength, scattered the proud, cast down the mighty, lifted up the lowly, filled the hungry, sent away the rich, and helped Israel by remembering the promise he made to our fathers.” Mary remained with her about three months, then returned. To kids: The light is always inside us and gives us joy and hope. When we seek light, we can make the world a better place. We can only make the world better with love. When the Apostle John wanted to say who God is, he said, ‘God is love.’ We go forward together toward the light to find God's love, which never leaves us, even in dark moments. Let's have faith in this love. Passionist: Mary gave Elizabeth the gift of her presence. Some prophets fought—Jeremiah ("too young"), Moses ("slow of speech"), Amos ("only a herdsman"), and Jonah (who fled)—but when Mary was called, she only asked how it could be possible. Mary was the first disciple and the first missionary. Salvation history was in the hands of a teenager and an elderly woman, and both responded, "Here I am." One Bread One Body: Today's feast is a sign of hope: when we need a visitor, God will send Mary, even if nobody knows we need encouragement. She loves her way in.